Christmas in France, what’s it all about, is it any different to elsewhere and is there anything special to enjoy? I’ve written about it previously describing how the build up is slow and calm even under normal circumstances, but this year we’ve had to contend with tragic terrorist attacks in Paris, the resulting state of emergency nationwide and potentially worrying regional election results as well, meaning it hasn’t been the most festive of times recently. Add to this a sense amongst many expats that Christmas is “better” at “home” surrounded by familiar traditions, sights and sounds and rather than feel happy and excited many find themselves feeling low and missing home. In a bid to spread some Christmas cheer I decided to ask my blogging friends what they like most about Christmas in France. 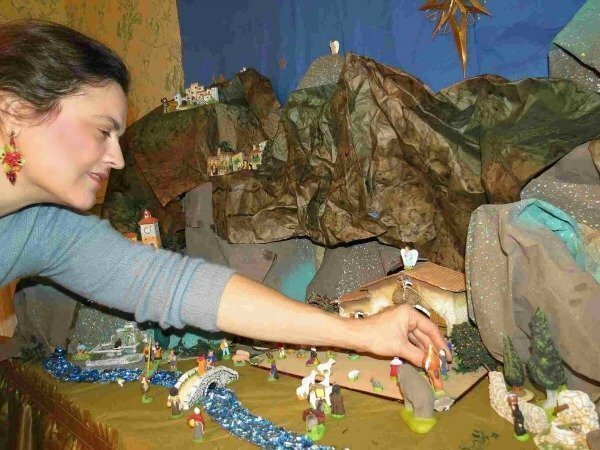 “I love it how every year we kick off the Christmas season in early December by setting up our family’s Provençale crèche, a nativity that uses clay figurines to depict the Provencal village scene. Then there’s of course always a good bottle of wine or two to get us motivated and scrumptious food to help us keep up our stamina – it’s hard work after all!” Girl Gone Gallic, a French-American living in Provence [find out more about the figurines called Santons here]. “One thing France gets right about this time of year is the focus on delicious food. 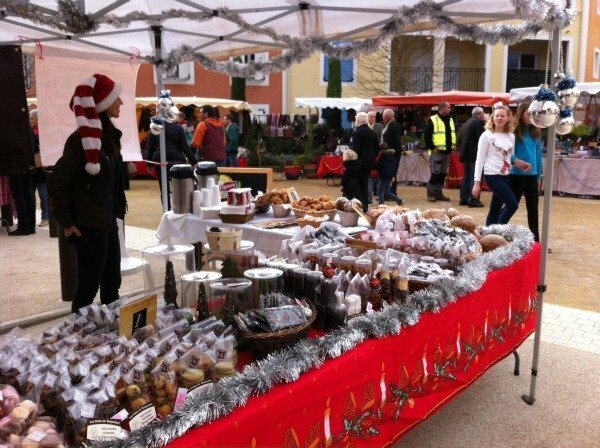 There are wonderful Christmas markets where you can sample seasonal fare as well as salons de gastronomie (food shows) where you can stock up on products from all over including a great selection of holiday items. A favorite that isn’t mainstream back in the US is the bûche (Yule log) that you cut in slices and eat for dessert. You can get ones made of ice cream or cake/frosting ones at the bakery and they come in all kinds of flavor combos.” Diane from Oui in France, an American expat in the Loire. “One of my favourite festive things to do in France is to sip a warm, sweet vin chaud while taking an after dark stroll around the wooden chalets that spring up in many town centres to house the Christmas market. 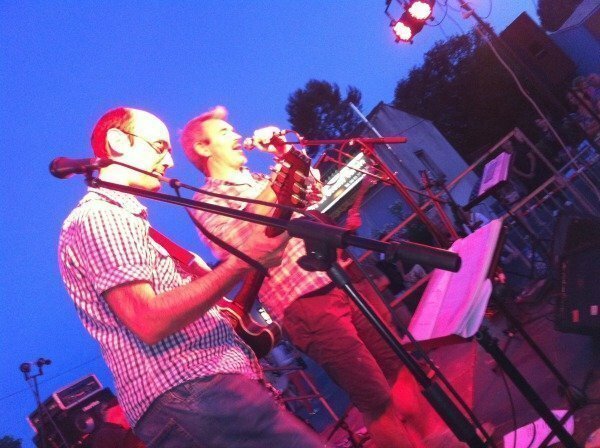 There are lights, music, food to eat, lots of laughter and it is a lovely thing to be part of.” Jacqui from French Village Diaries, a British expat in Poitou-Charentes. “Christmas is a wonderful time of year here in the Creuse. There are no hectic shopping malls and rushing round the shops on Christmas Eve. It’s about the simple pleasures and appreciating what we have with our loved ones.” Ema from De Tout Coeur Limousin, British expat in rural France. 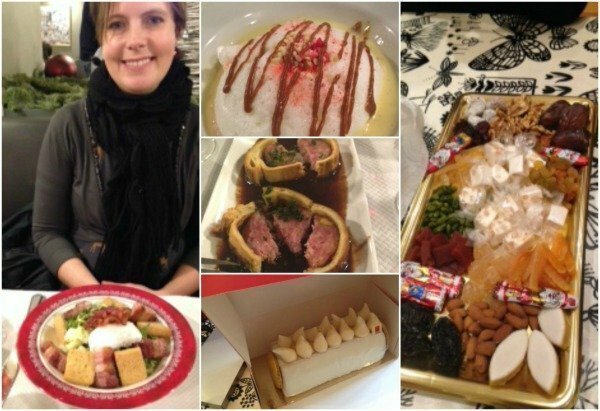 “One of the things I like best about Christmas in France is the food! It’s traditional to eat foie gras and oysters as a starter. 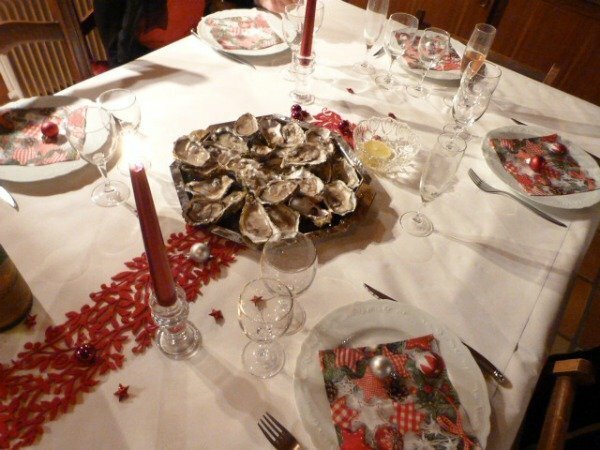 France is the leading oyster producer in Europe (90% of production) and half the oysters produced are eaten at Christmas and New Year. We now make our own foie gras, often with friends. It has to be made at least 10 days before it is eaten. It’s usually eaten with toasted pain de mie (sandwich loaf) and sometimes pain d’épices (ginger bread) together with fig or grape jam, jelly or compote. It can be made from goose or duck liver and also contain fine shavings of truffles. Just like oysters, you like it or you don’t! I do.” Rosemary from Aussie in France, an Aussie in France! Formerly in Paris now in Blois. 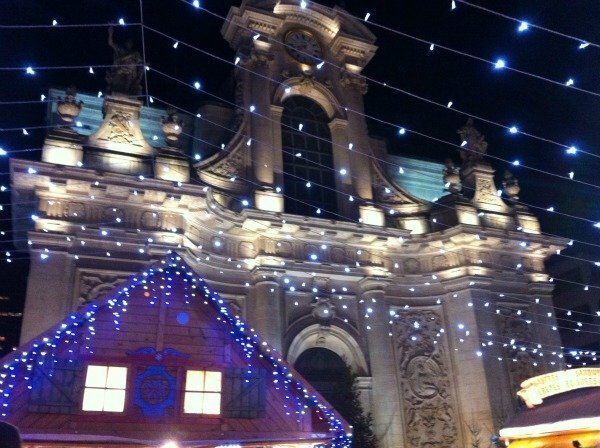 “My favourite thing about Christmas in France is visiting the Christmas markets with my family. I grew up in the Southern Hemisphere so my childhood Christmases were spent al fresco at the beach, or enjoying a Christmas barbecue! So, the thrill of wrapping up warmly and browsing stalls selling gingerbread, roasted chestnuts and chocolates is lovely and I always make sure to stop for a glass of vin chaud! I also enjoy admiring the effort the French put into Christmas decorations in shop windows, on the street or hotel lobbies. 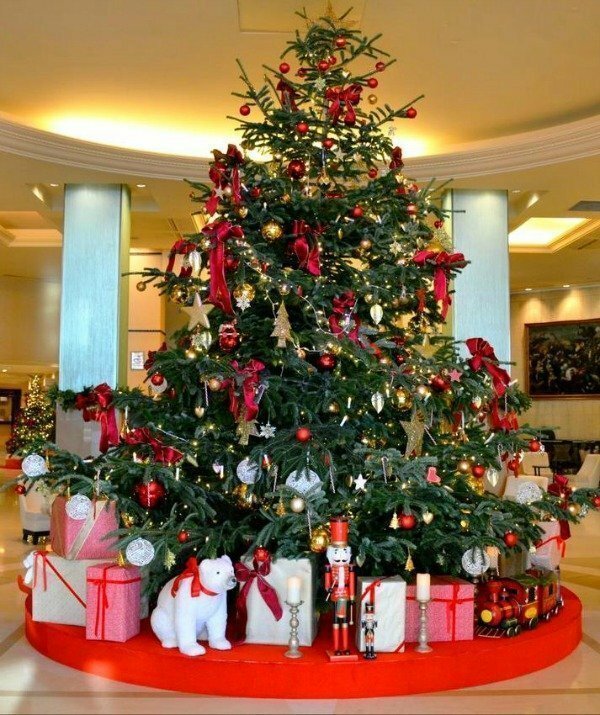 The displays often look classic and sophisticated, I spied this Christmas tree [below] in the lobby of a hotel in Cannes, gorgeous don’t you think?” Becks from Access Riviera, a New Zealander on the Côte d’Azur. “What do I miss about Christmas in France when I’m in the UK? That’s an easy one! I really miss the fact that in France, it is a longer celebration altogether, starting with family on Christmas Eve with a big dinner. In the morning, we all open our presents in our pyjamas and the whole family gets together for lunch. ‘Lunch’ should be used loosely, really, as we spend the whole day sat around the dining room table, eating, chatting and playing board games before we eat some more. I love that. 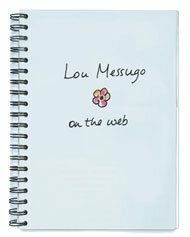 We really spend quality time all together.” Mel from Le Coin de Mel, a French expat in London. 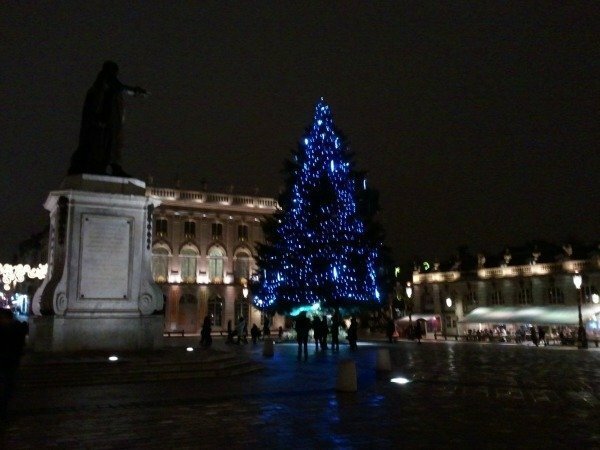 “I love the calmness of Christmas in France (compared to the mad rush that it always was back in London!) Here we retreat into our cosy home by the log fire with the family, visit local villages for the Christmas markets, get together with friends for mulled wine and (lots of imported!) mince pies! I sing French and English Christmas carols in village churches with my choirs. The kids look forward to decorating the village tree and their 4 course Christmas lunch at school complete with a cheese course and fizzy juice.” Becky from Rue du Belvedere, a British expat in rural France. “My favourite thing about Christmas in France is vin chaud. 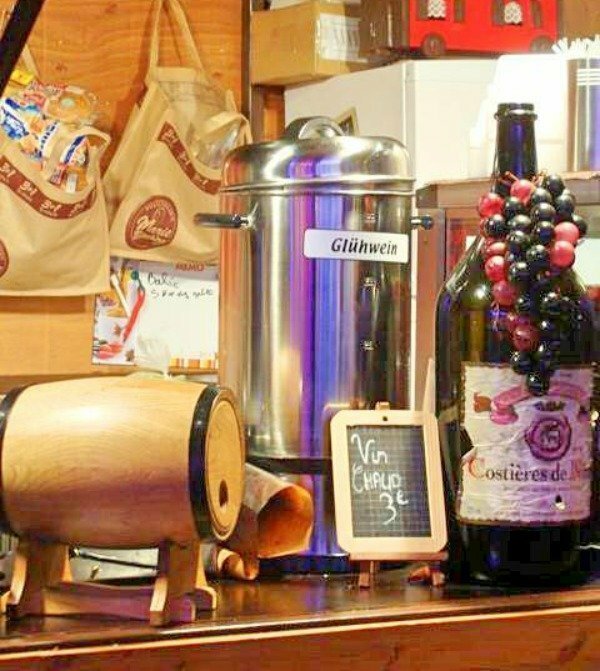 Mulled wine certainly isn’t exclusive to France but our small local Christmas market, when we lived in the Pas de Calais, made an excellent vin chaud that they served from a large black cauldron rigged over a real log fire, which all helps with the appreciation of it. 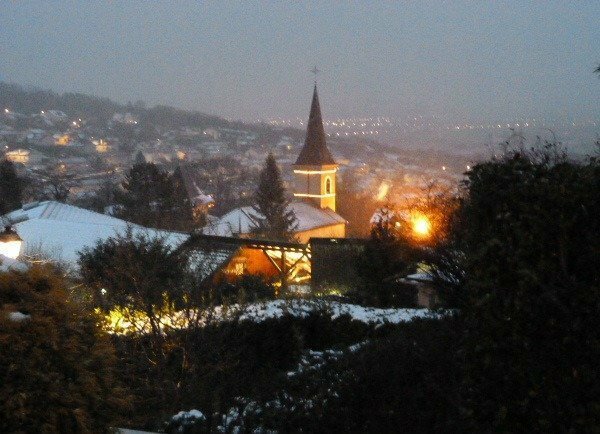 We would get a cup to finish the day and warm us up while we waited, amongst a sea of children, for the Père Noël to abseil down the church tower showering everyone with sweets.” Back to Burgundy, British expat in Burgundy. “Our first December in Paris, we went to La Défense to go to the movies. Instead, we stumbled upon our first magical Christmas market and have been obsessed ever since! We love all the markets for the sweet smell of cinnamon churros contrasted with the savory scent of the sausage platters. We love it for the Christmas music jingling through the loudspeakers and to watch everyone happily ice skating under the City of Light. We love it because Christmas in Paris gave us an entirely new tradition of our own. It didn’t matter anymore what we might be missing back “home”; we could look at each other in amazement and say, “we live here.” The warm Christmas spirit in France had so much to do with our settling into our expat ways and it’s now our favorite time of the year.” Christy from What Up Swags, American expat formerly in Paris recently moved to Bavaria. “What I love about Christmas in France is the FOOD! Having a LOOOONNNNGGG family dinner on the 24th December in the evening, eating the most amazing foods over several hours – Christmas dinner in the UK is not just the same somehow.” Sophie from Franglaise Mummy, British expat formerly on the Côte d’Azur now in Mauritius. 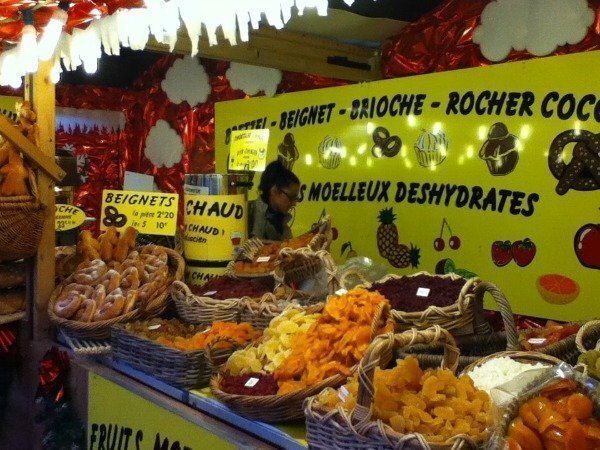 “My favorite thing about Noël en France is when I go to the last market before Christmas. There is happiness in the air (probably due to the amount of wine flowing), everyone is smiling and everyone wishes you “bonne fetes”. The best is that almost every stall holder has cookies, cake or wine that they make sure you partake in – it’s truly a time, no matter where you come from, when you feel welcome and part of the community.” Di from The Sommelier Chef, British expat in the Pyrenees. 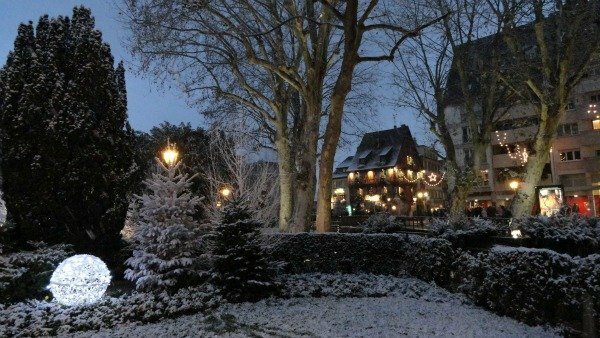 “I have had many Christmases away from France now but I still miss the dark nights with all decorations out. I always associate Christmas with winter (cold, dark nights) so it feels weird to be wearing t-shirts and flip-flops. I noticed something in last couple of years: as much as spending Christmas in summer is different but ok, going through winter with nothing to celebrate is hard! My husband misses foie gras!” Carole from Bons Baisers d’Australie, French expat in Australia. 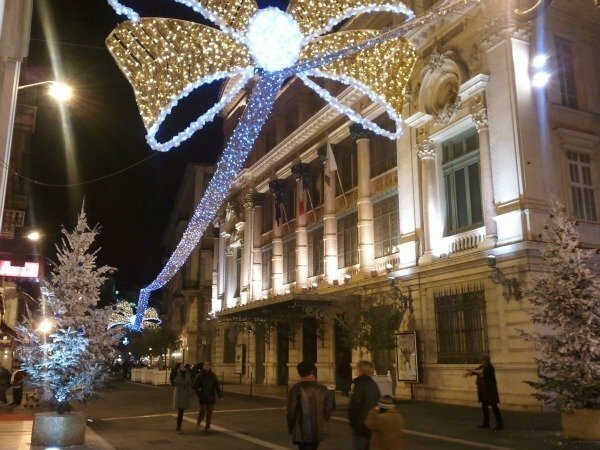 “Christmas in the south of France… What’s not to like? Christmas markets pop up and ice skating rinks appear in town squares. Elaborate Nativity scenes display every Provencal character imaginable, and of course there is the bûche de Noël (yule log) cake. Cities drape themselves in lights, and the weather is mild enough to get out and enjoy it all. What could be better?” Margo from The Curious Rambler, American expat in Nice. “I love the Christmas markets in France, the smell of vin chaud in the air, carols playing and the joyful mood of the approaching holiday. There is a magical atmosphere in December. 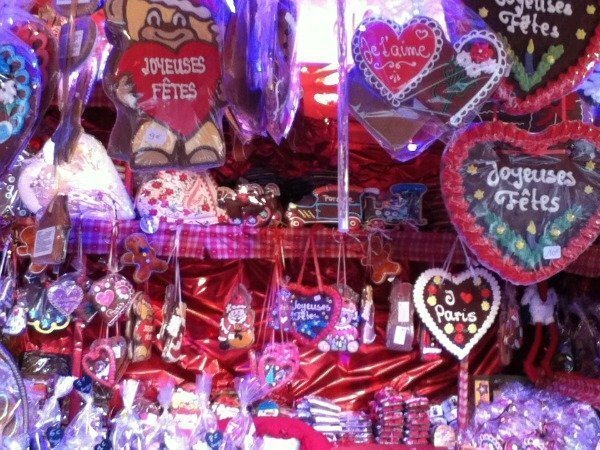 My first French Christmas market was that of Colmar, I felt like a child again in a winter wonderland!” Holly from Franstralie, an Australian expat in Paris. 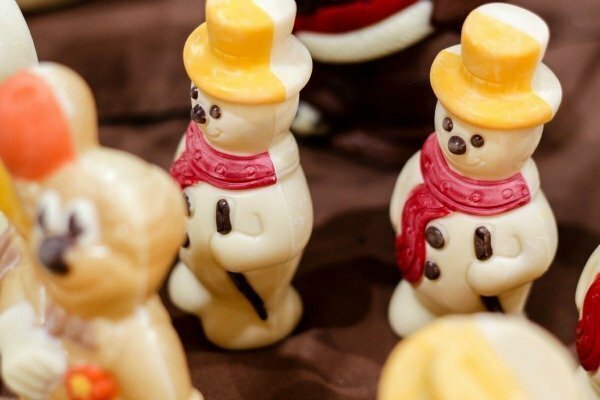 “Highest on my list of things to love about Christmas in France is the gastronomy. If I thought that the French were gastronomic all year round, I had seen nothing until I had experienced my first French Christmas, when the Gallic love of good food is taken to a whole new level. Supermarkets become gourmet palaces, with entire aisles dedicated to seemingly unending supplies of oysters, foie gras, coquilles St Jacques, and champagne. In Lyon the best place to experience this is in Les Halles de Lyon, where you will be assailed by tempting sights and smells from all directions. Here you can shop for your poulet de Bresse or your traditional bûche, and taste morsels of cheese, smoked salmon or delicious artisanal terrines.” Emily from Lost in Lyon, British expat in Lyon. “What I miss the most here in Germany is “la bûche de Noël”. I always had a bûche for Christmas, even if I was sick and bedridden. I wish I could serve a bûche to my kids this year, but it’s going to be hard to find one. Of course I could bake one… but, let’s just say I’m not that good with baking. 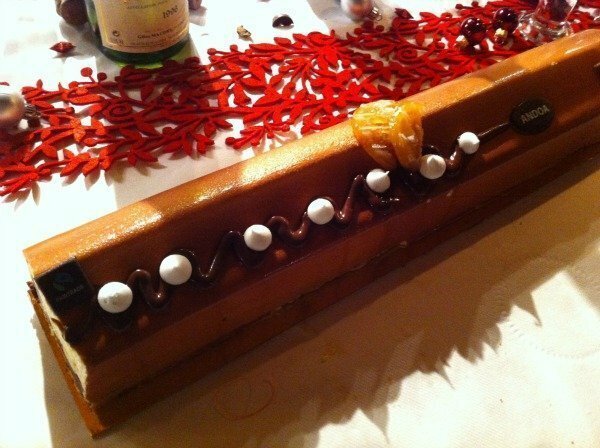 So for me, THE Christmas dessert will always be a bûche.” Eolia from La Cité des Vents, a French expat in Germany. “What I love about Christmas in France is the fact that the whole thing is much less strung out than in the UK. Although a handful of shops may stock some Christmas lines before December, few will have any decorations up before then. Then, come December all the towns and villages will put up wonderful light displays, the most elaborate nearby being at Beauchêne, a few kms away from us. Shop windows will also be beautifully decorated and there will be Christmas markets everywhere, all selling wonderful hand-made gifts and locally produced foods. It all seems so much more special for being over a shorter period of time!” Rosie from Eco-Gîtes of Lénault, a Brit in Normandy. “My husband and I started a tradition in Paris to usher in the holiday season. Each year, we head over to the grand magasins on Boulevard Haussmann for a little date night. 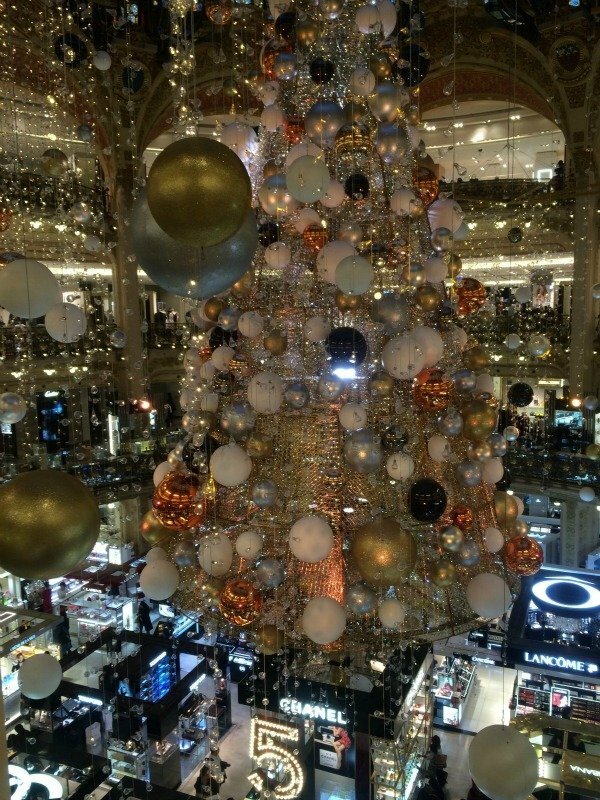 We start at Galeries Lafayette, where we head inside to warm up and admire the huge Christmas tree in the center of the floor. We usually swing by one of the two Pierre Hermé stands inside to buy a few seasonal macarons to eat later on (like chocolate with foie gras – it’s better than it sounds!). Afterwards, we head back outside to see the playful window displays of Galeries Lafayette, and then move down the street to the chic, designer-crafted windows of Printemps. It’s one of our favorite ways to kick off the Christmas season and get in the spirit come December! “ Sara from Simply Sara Travel, an American recently moved back to the US from Paris. “Christmas in France – I’m converted. Cosy nights, mulled wine and glittering Christmas lights versus beach days, prawns (on the bbq) and the sound of cicadas filling the humid air. The festive season works better in winter. Although I do miss sipping champagne in the swimming pool! 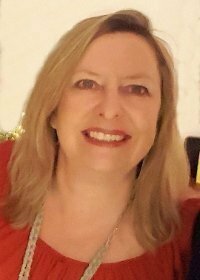 “ Chrissie from The Riviera Grapevine, Australian expat in Nice. “Throughout December the villages and towns of France bustle with Christmas markets, their streets lined with tinsel and bow decked Christmas trees, their street lamps adorned with fairy lights, everywhere looks beautiful, everywhere is full of life. 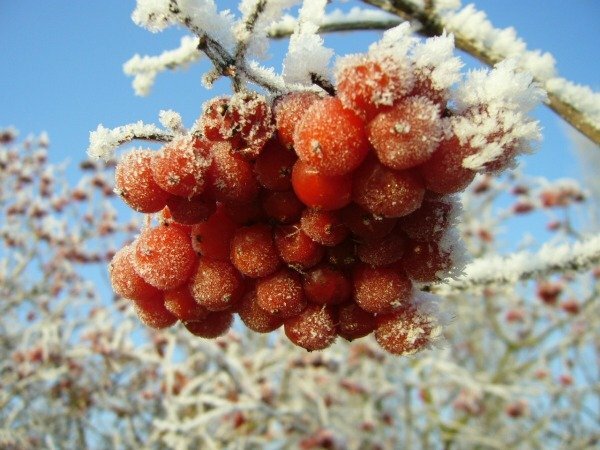 Christmas for me is a time to enjoy walks in the frost or snow, sneakily pick a few sprigs of mistletoe from the trees, drink a bière de Noël or a vin chaud in the local bar or at home in front of the wood burning fire, and laugh at parties as French and English friends try to communicate as best they can. In essence Christmas in France is no different than back in the UK, I just think it’s more pure, more focused on family and friends rather than razzle-dazzle, over the top celebrations, and I think that’s just perfect!” Katherine from Le Jardin Perdu, British expat in Corrèze. “What I love most about Christmas in France is the spirit of family and unity that I witness year after year in my belle-famille [family in law]. Everyone goes to great lengths to be together at Christmas and we spend the 24th and 25th together. Now that the family is expanding, it has become more of a challenge, but whenever it is possible, the entire family still comes together. This photo [below] is from Christmas 2013.” Maria from Trilingual Mama, an American living in Normandy. “In France I do love that Christmas is not too commercial. There is excitement, and the lights in the towns and villages are so pretty, the shops and restaurants are decorated, but it is not over the top. The excitement is allowed to build slowly, there is still a strong emphasis on family. I absolutely love the open air patinoire, the ice skating rink, surrounded by little wooden chalets selling local specialities and I also love that the bakery is open on Christmas morning. Where else in the world would a baker be open on Christmas morning, but here in France! 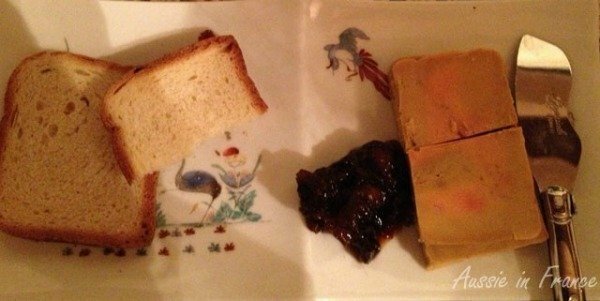 We wander down the road and collect our bûche, it’s actually become quite a tradition and is very much part of a French Christmas.” Susan from Our French Oasis, British expat in SW France. And what about me? Just like nearly everyone here I love the focus on food. Food is important at Christmas all around the world, but in France it really is “taken to a whole new level” (to quote Emily). As Susan points out, where else in the world is your local village baker open on Christmas day just so you can have croissants for breakfast and the freshest bread possible for Christmas dinner? Foie gras has become an integral part of my Christmas meal (though I don’t actually make my own like Rosemary) and it’s no secret, I too love vin chaud. I enjoy the Christmas markets, especially the small one day local affairs and skating under the blue skies of the Riviera is one of our favourite things to do en famille in December. I’ve rarely seen municipal decorations I don’t like, they are nearly always understated and elegant and when we lived in Paris we made sure we visited the window displays of the grands magasins every year just like Sara. But above all I love that Christmas just isn’t crazily commercial here, it doesn’t start in October and the consumerism is limited to choosing the best possible food and not the biggest bargains on electrical goods. It’s simple, France is a very special place to celebrate les fêtes de fin d’année. 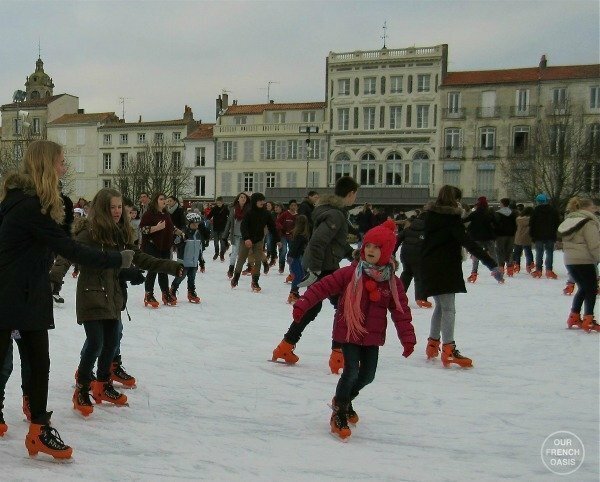 I hope you’ve enjoyed reading about Christmas in France and if you’re a homesick expat I hope you’ve found some reasons to enjoy Christmas where you are. Please share your experiences in the comments. Thank you so much to all the lovely French and Francophile bloggers who took the time to send me their thoughts and pictures at this busy time of year, I adored all the positive, wonderful reasons to love Christmas in France. Wishing you all a very happy Christmas where ever you are – joyeux Noël! All photos credited to the appropriate bloggers, photo for PIN by Sara from Simply Sara Travel and where no source is provided they’re mine. If you enjoyed this, please share it. Why not PIN it! Oh, this was so nice to read! I miss the beautiful lights and Christmas windows in the grands magasins in Paris, and vin chaud, of course! You’d love the Provencal santons then Annette. 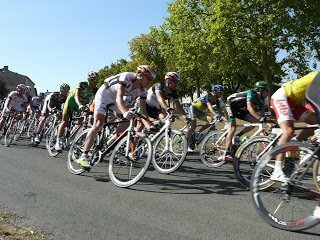 It’s hard to feel christmassy in Provence until closer to the event I think. By the time it arrives there’s enough going on to get into the spirit but it’s definitely important to make your own traditions too. My partner and have tried to make our own traditions here in France. Christmas doesn’t really seem Christmassy at all in Provence without the snow. Every year, we go to the Senas-Alsace market for a little Germanic influence. There, we always buy a plate of choucroute and german sausages from the butcher and eat it in the square. It’s lovely! Nativity scenes are much more popular in France than Australia. Checking out the nativity scenes in shops, churches, parks etc is my favourite thing to do at Christmas time in France. I have now bought my own nativity scene for my Australian home and it gives me such joy to arrange it every year now. French Christmas looks beautiful with just the right amount of fuss! Phoebe I loved reading this!! There seems to be common themes in that the food (and wine!) and the markets are amazing and that it’s a lot less commercial…….it sounds very traditional and family based, just how it should be!! I love this post Phoebe! It made me laugh that so many people mention “calm” and “food”, but I also like the spirit behind it. It can be hard to be away from your extended family at this time of year, but I’m also a firm believer in being open to new ways of celebrating and making Christmas your own. We’ve just spent our first in Sweden and though it was by no means traditional (either by British or Swedish standards! ), we really enjoyed ourselves. MMMM that looks really nice and Christmassy (and god you have just made me hungry!) unlike Christmas in Pretoria which is underwhelmingly non-Christmassy! It is of course very hot and the South Africans certainly don’t go OTT. It is the big summer holiday so many of them go away to the beach for the month – a bit like August in Paris. We actually really liked it without the fuss, but I do miss the “Christmassy” feel of home a bit…. I hope you had a filling foodie Christmas Becks!!! Thanks for participating. My pleasure Christy 🙂 Hope you had a great festive season. I’m amazed you think Christmas here is too commercial, you really should spend October-January i England and you’ll reassess!! I’m glad you enjoyed the post Rosemary. Too true Jen, I hope you had a lovely slow Christmas! “some bloke from the Middle East who died millenia ago and is probably imaginary anyway” excellent! My feelings exactly (about that bloke) but my birthday isn’t close and I’m happy to celebrate Christmas no matter what! Thanks for your lovely long comment. Oh you should give it a go one year Sonia, see what you think. I’m glad this could counterbalance your bah humbug! Hope you had a great Christmas all the same!! Thank you Rosie, you too! Thanks Sophie! Bonne année to you and your family! (Hope you HAD a great island Chrstmas). And we did have a lovely Christmas…in England! I’m pleased you enjoyed this post though Catherine. Thanks for being involved Holly. I love your description of Christmas in Singapore! I hope you had a lovely Christmas Lisa. I’m happpy it helps in your planning Clare Mary. Thanks Harriet, I’m glad you enjoyed it. 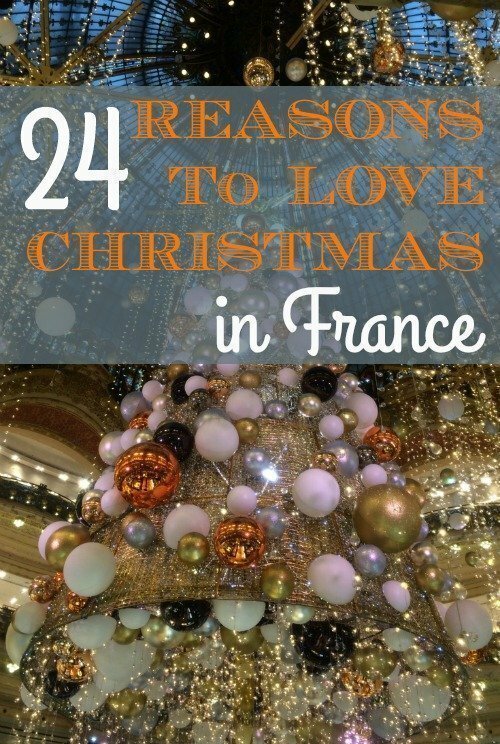 Thanks for sharing this Phoebe, my hubby and I are looking to spend this years Christmas in France. We love skating, we also love good food like you do. Have you written any article on good restaurants in France? A great post – and a lovely way to counter any Chrismastide homesickness. My husband and I are thinking of spending next Christmas in Europe. This was wonderful and I will keep it to help us make plans. Merci! Really super post Phoebe. Great idea. The theme really is “food and family” and maybe not as much commerciality as in the UK. I would really love to spend Christmas in France but – for me it’s all about family too – and they are here in England [oh, and in Singapore where Christmas is VERY GLITZY! and the muzak in the shops is ten times louder and ghastly than even here!]. Wishing you a very merry Christmas and a fantastic 2016. We will see you all very soon Phoebe and we will make your Christmas quite special. France is always wonderful for me and I loved reading this blog. Our carol singers are knocking on our door at this. Very moment. This was wonderful to see and read!! Happy Christmas to you! What a lovely post – really enjoyed reading about French traditions and everyones favourite parts of CHristmas. A nice reminder as to why we don’t herd onto flights which are often delayed or cancelled for stirkes at this time of year ..gallavant around the UK trying to see everyone and sleeping on floors and sofas as there just isn’t enough room for us all and then having oversize luggage due to the presents such as for me one year an inflatable ball pit!!! Thanks for the inclusion Phoebe. I’ve also linked back to this as a merry counterbalance to my scribblings in my recent Bah Humbug post! We started coming to France for Christmas long before we lived here. The reason was that Christmas in London was deadly dull if you didn’t have family or transport. Everything closed for days, no public transport. In France many things remain open and it is a lovely mini break, visiting museums and eating well. I didn’t really get Christmas at all until we arrived in the northern hemisphere. Suddenly all those lights made sense. Christmas in Australia is nice, but it is like it is a completely different thing for us. Plus my birthday is so close to Christmas that I’ve never been very impressed by the focus on some bloke from the Middle East who died millenia ago and is probably imaginary anyway. Quite an eclectic mix of responses! Oh, I loved reading everyone else’s Christmas favourites! I think Christmas starts too early in France and is really too commercial, but maybe that’s because I’ve lived here for more than 40 years and don’t have any real comparison !!! Great idea, Phoebe. This came out so great, Phoebe! What a wonderful idea and thank you for “gifting” this to all of us this Christmas! Have a wonderful holiday! What an enjoyable blog. Happy Christmas to all the contributors. And to Phoebe and her family, from another part of it! Thanks for inviting me to contribute! So great to hear all these fab experiences, though reading this has made me hungry! Happy Christmas to you too Becky, I hope you have a great time in Albi. Happy Holidays Sara, it was a pleasure to include you and your beautiful photos of Galeries Lafayette! Enjoy your foie gras Di! It was such a pleasure to do this, joyeux noël to you too. Thanks Susan! Yes, we all have similar outlooks that’s for sure…..mainly based on food! We won’t be going this year but we always used to when in Paris and I love the views from the terrace too, I was last up there on my birthday in October. Yes that was pure luck Maria as I didn’t exclude anyone who sent me something but I think it’s very satisfying too. Such a lovely post! Thank you for asking me to take part. So many similarities, lots about food! We can’t wait for school to finish this week so that we can really get into the Christmas spirit. We have family arriving at the weekend and a mad rush next week to finish Christmas shopping. Hoping to get to the Albi Christmas market and find some ice skating for the kids. Hope you have a very Merry Christmas! I love how this post came out! Thank you for including me – what a lovely round-up of so many great (and delicious) reasons to love France during the holidays! Joyeux Noël! Beautiful post and I love that there were 24 entries! Joyeux Noël! Great post! I see everyone likes the food as much as I do…my stomach is already showing signs of the festivities. If you go see the windows of the Gallerie Lafayette and le Printemps in Paris as Sara suggested, don’t forget to pop up to the terraces for an amazing view of the rooftops. Awesome Phoebe, thanks for taking the time to do this. I’m off to get some Foie Gras now!